The markets are hovering on the flat line today as they await the jobs numbers tomorrow morning. Oil is spiking higher along with gold and silver as the Dollar declines and Libya becomes a bigger mess. You thought “Elliott wave” was a surfing term for a wicked breaker, dude. You’re tired of fundamental analysis of financial markets leaving you behind the trend-moving curve, AND you’re ready for an alternative. The Elliott Wave Principle resets the stage from an entirely different starting point. Wave analysis asserts that while certain news events can have a temporary, near-term effect on market prices, the larger trend is governed by one consistent force: social mood, or collective investor psychology. This source of markets’ trending power unfolds in calculable wave patterns visible on a market’s price chart. Elliotticians know of 13 such patterns, each of which adheres to specific rules and guidelines. Ultimately, if you can identify one of these patterns, you can project what direction the pattern will move prices AND how far into that direction prices may go. The best part is, Club EWI has recently re-released our most comprehensive Wave Principle tutorial ever, at no monetary cost. This 10-lesson course leaves no stone unturned and no question unanswered about the basic recognition of all Elliott patterns and their practical application in real-world markets. Join the rapidly expanding Club EWI community today and get the complete, free Wave Principle Tutorial. This article was syndicated by Elliott Wave International and was originally published under the headline Everything You Ever Wanted to Know About the Elliott Wave Principle, Free. EWI is the world’s largest market forecasting firm. Its staff of full-time analysts led by Chartered Market Technician Robert Prechter provides 24-hour-a-day market analysis to institutional and private investors around the world. BOSTON, March 31, 2011 – Currensee, (www.currensee.com), the alternative investment service that gives investors unique access to the world currency markets, is proving popular with growing money managers eager to find new retail investors. Currensee has seen the proportion of applications from Forex money managers to the Trade Leaders™ Investment Program double since January 2011. The program allows retail investors to automatically replicate the trades of some of the most successful traders in the world, called Currensee Trade Leaders. Trade Leaders receive 15 percent of the monthly profits they generate for the investors that have chosen to automatically follow their trades. More than $3 billion has been traded through the program since its launch in October 2010. The program is available worldwide and has investors from more than 50 countries, giving money managers the ability to grow their businesses globally without the headache of marketing, operations and reporting. Of the 14 Trade Leaders selected by Currensee after extensive checks and analysis, 11 are money managers, including three recently added Trade Leaders – Gabor FX, a Hungarian trading group, Trader Tradingsystema, a Swiss investment company, and Joiny FX, a Chinese money management firm. Joiny FX has been trading Forex for six years. They run a private investment fund and manage an international client base, with most trading volume happening in the early European session. JoinyFX’s Trade Leader profile and performance history are at http://app.currensee.com/forexpert/forex-trading/profile/JOJAR.C. Gabor FX is a Hungarian professional trading group that primarily trades the EURUSD, GBPUSD and USDCHF, using technical analysis and the well-known Turtle Trading System. One of Gabor FX’s accounts is a position trading account with an average duration of 25 hours and consists of 10 trading strategies that are monitored 24 hours a day. The other Gabor FX B account focuses on special situations and longer trade durations. Gabor’s profile and history are at http://app.currensee.com/forexpert/forex-trading/profile/GAFLL.B and http://app.currensee.com/forexpert/forex-trading/profile/GAFLL.C. Trader Tradingsystema is a Switzerland-based money manager that has been successfully navigating Forex for six years. The firm focuses on short-term targets in the EURUSD, with average trade duration of four hours. Trader Tradingsystema runs a closely supervised automated system that firmly manages risk. Their profile and history are available at http://app.currensee.com/forexpert/forex-trading/profile/ANBZN.A. Currensee is accepting applications for Trade Leaders from up and coming money managers at www.currensee.com/tradeleaders. Currensee is the alternative investment service that puts the power of world currency markets in the hands of every investor. With the Currensee Trade Leaders™ Investment Program, investors build their own automated trading portfolios of Trade Leaders, top foreign currency traders hand picked from the thousands of members of the Currensee social network. The program offers investors an alternative to traditional asset classes and Trade Leader performance is completely uncorrelated to the stock market. Currensee delivers complete account control to investors, who can see every trade in real time, manage and modify investment allocations with one click and benefit from the safety and security of proprietary online investing technology. Currensee is funded by North Bridge Venture Partners, Egan-Managed Capital and Vernon & Park Capital and is a member of the National Futures Association (NFA) and registered by the Financial Services Authority (FSA). For more information, visit us at www.currensee.com. Find us on Facebook, follow us on Twitter, and watch us on YouTube. Factory orders declined by 0.1% in February, surprising economists, who were looking for a 0.5% increase. Shipments of manufactured goods rose by 0.3%, the Commerce Department reported. Most of the decline was fueled by government spending cuts for military equipment, but businesses also cutback purchases of tech hardware, according to the report. Business capital spending fell for the second month in a row, but overall orders are up 26.4% from their low in March 2009, according to the AP. The major indexes reflected little reaction to the news. The Dow Jones Industrial Average leads, up 0.15%. The Nasdaq composite index and the S&P 500 are both fractionally negative. 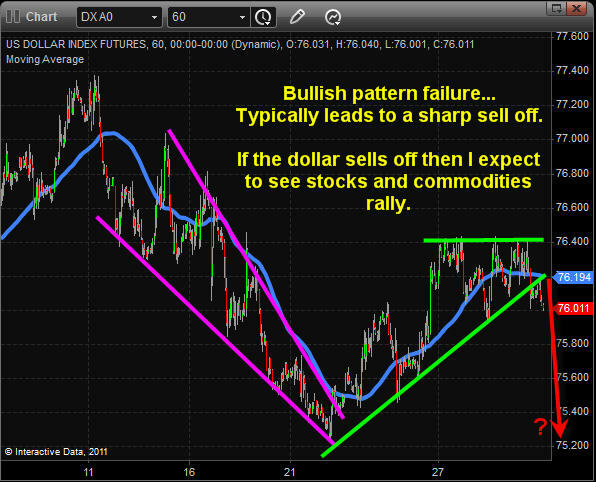 Mid-Week Trading Analysis: Stocks, Commodities to be triggered on next US Dollar move? Over the past couple months everyone seems to have been preparing for a sharp market correction. Crazy part is that the SP500 dropped about 10% from the high and that is a typical bull market correction. The thing is… the stock market has a way of slowly unfolding making it look and feel minor, then before you know it, the correction is over and it’s back to an uptrend. That is kind of how this one unfolded. As you can see below the dollar looks to have started a breakdown today. If there is continued selling pressure in the next couple days then expect to stocks and commodities to move higher as the US Dollar drops. It is important to know that when a bullish pattern fails we typically see a very strong reaction in the opposite direction (down) catching the majority off guard and they rush to the door. A couple weeks ago we watched the market go into a free fall creating a washout bottom. From there we saw prices bounce back and retake my key moving averages. This gave us a bullish bias and dips should be looked at as buying opportunities. I will admit that stocks still have a long way to go before the masses are convinced. I feel we need to see the February and March highs get taken out first. Once they get taken out there should be strong buying as short covering (protective stops from traders who are short) causes a surge in buying pressure sending stocks sharply higher yet again. My trading buddy David Banister at Active Trading Partners is starting to see small cap stocks come back to life. Money is starting to flow into these lucrative areas of the market and he is on top of things… This week’s trade is up 20% in less than 24 hours which is very exciting. 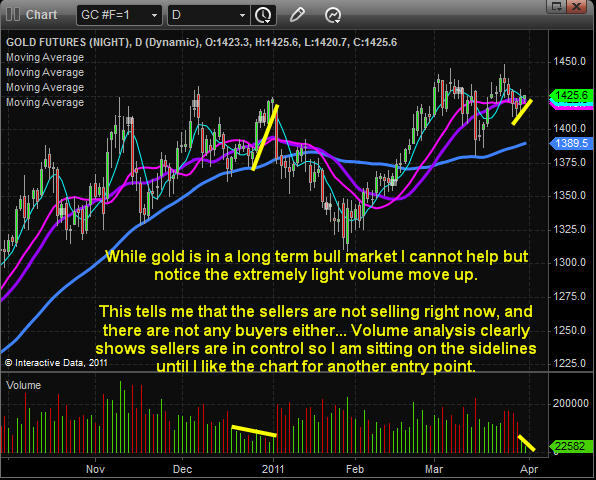 Gold has been moving up this year but the current price action is not really getting me excited to buy just yet. 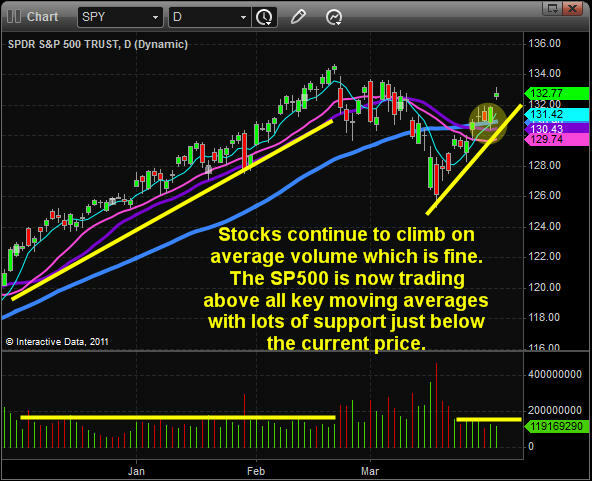 Recently we have seen strong selling volume and very light buying volume. My bias still favors higher prices but there is still a good chance we get another dip in the coming sessions. In short, I feel as though the dollar will trigger the next wave of buying in stocks and commodities for the next week or two… We should see the dollar make a clean moving in either direction shortly and that will help guide my analysis, positions and setups. I hope this analysis helps you to see the market from a different perspective. The euro was trading higher in morning trade and the buying increased after the release of better than expected German unemployment data. This afternoon traders are anticipating Canadian GDP data and US weekly unemployment claims. Euro gains were strong in the morning hours following the release of the German unemployment change which showed the number of people out of work declined by -55,000 to 3.01M. Economists had forecasted a reduction of only -24,000. The report was also boosted by last month’s revision up to -54,000 from -52,000. The improving unemployment picture is surprising given the unstable month that passed as the geopolitical events in Africa and natural disaster in Japan did not deter German employers from adding to their payrolls. Also boosting demand for the euro was higher than expected inflation numbers. The CPI Flash Estimate y/y was higher at 2.6% for the year. Economists had forecasted a 2.4% increase. The rising inflation numbers reinforces the market’s view for an ECB rate hike at its next meeting April 7th and should bring further bids to the euro. At lunchtime during the European trading session the EUR/USD is higher at 1.4211 from 1.4131. The EUR/USD is currently approaching the 1.4250-1.4280 resistance level off of the March and November highs. Further resistance is found at the January 2010 high at 1.4580. The EUR/JPY is trading near its daily high at 117.75 from 116.82. An initial target for the pair is 119.60. The EUR/CHF is up at 1.3001 from 1.2969 with resistance at 1.3040. This afternoon traders will be following Canadian GDP at 12:30. The CAD has performed nicely versus the dollar and is approaching the swing low on the daily chart at 0.9666 where multiple stops are located. Resistance is found at 0.9730. US weekly unemployment claims will also be released at this time. The dollar was down on the day as an equity rally fueled greater risk taking in the FX markets. As such, lower yielding currencies such as the dollar and the yen sold off. Today, traders will be anticipating US weekly unemployment data, a day prior to Friday’s jobs report. The dollar was down on the day as an equity rally fueled risk taking. Global bourses were higher with the gains beginning in Asia as the Nikkei was up 2.6%. In Europe the DAX rose 1.8%, while the Dow climbed 0.6%. As the equity rally built momentum, traders sold traditional carry trade currencies such as the dollar and the yen to fund higher yielding equities. Trading of the EUR/USD was more volatile than usual, with the pair moving as low as 1.4051 just prior to breaking higher during the New York trading session to 1.4146 where the pair closed at 1.4131. The GBP/USD was up on the day at 1.6088 from 1.5994. The Aussie dollar reached a new all-time high at 1.0345 before closing at 1.0317. Today traders will be focused on the release of US weekly unemployment numbers scheduled for 12:30 GMT along with Canadian m/m GDP. Markets will also be following the Chicago PMI survey at 13:45 GMT. Tough talk by Fed officials for a normalization of US monetary policy fell to the wayside as traders continue to focus on yield. Until Fed Chairman Ben Bernanke hints at a pullback in the Fed’s liquidity programs, traders will continue to use the USD as a funding currency in search of higher yielding assets. EUR/USD resistance is found at 1.4220, 1.4250, and1.4280. Support is located at 1.4150 followed by 1.4115, and 1.4020. The euro moved higher versus the dollar but fell against the Swiss franc as traders continue to focus on expected rising European interest rates. Spurring euro gains were comments by ECB executive board member Lorenzo Bini Smaghi who said the ECB will be looking to raise interest rates gradually. The Swiss franc was supported by a strong KOF Economic Barometer which shows the Swiss economy may be accelerating faster than forecasted. The EUR/CHF climbed to the resistance level at 1.3038 before falling to close at 1.2969. The 1.3038 level coincides with the March high. A breach above this price could target the 200-day moving average which comes in today at 1.3075, followed by the February high of 1.3200. Recent comments by St. Louis Fed President James Bullard have been dollar supportive but the affect wore off into European trading. Bullard was quoted saying the Federal Reserve should begin discussing scaling back its $600B quantitative easing program. Traders continue to focus on the expected interest rate increase at the next ECB meeting on April 7th. This event has been built up with such significance that it may present a situation where the ECB will disappoint traders. Much of the built in premium to the euro is on the basis of successive interest rate increases and a normalization of European monetary policy, not simply a one-off adjustment. The currency should continue to be supported with further comments by ECB members expressing their support for multiple increases to the interest rate. Downside risks for the currency may be a delay in rising European rates. As traders continue to search for increased yields, they have turned to funding their trades with the low yielding yen. In addition to the G7 intervention, a return of the carry trade has helped to drive the yen lower following its sharp appreciation during the middle of March following the earthquake and tsunami. The yen has been on its back foot versus the euro with the EUR/JPY rising to a new high in early European trading. The pair is currently trading up at 117.45 from 116.82. Versus the dollar, the USD/JPY is up at 82.80 from 82.66. The Japanese currency is now trading at its weakest point since the G7 intervened in the FX markets. It appears traders have been positioned out of long yen trades by the unilateral intervention. Also improved risk sentiment is helping as traders unwind risk-off trades from the previous two weeks and are moving into carry trades which support a weaker yen. USD/JPY resistance is found at 83.30. This level has extra significance as it coincides with a falling trend line off of the September 2010 high. A breach of this level would then target 84.00. To the downside, support is at 82.00 and 81.60. The continued violence in Libya caused oil to make slight gains during the Asian trading session, despite the fact that US stockpiles of crude oil rose significantly higher than expected according to a report released yesterday. Typically a high US crude inventory signals that demand is down and leads to a drop in prices. It appears that supply worries due to Middle East violence are still propping up prices. Currently crude oil is trading at $104.85 a barrel, up close to $1 since last night. With no clues as to if or when the situation in Libya will become pacified, traders can expect the price of crude to remain above $100 a barrel for some time. That being said, tomorrow’s US Non-Farm Employment Change figure is likely to inject significant volatility into the marketplace and the price of oil is likely to be affected. Traders will want to watch out for any surprises which could cause crude to shift dramatically. Technical indicators are beginning to show signs that this pair may be in overbought territory, signaling a downward correction may take place today. A bearish cross on the 8-hour chart’s MACD has taken place, while the Bollinger Bands on the same chart are beginning to tighten. Opening short positions may be a wise choice today. The 8-hour chart’s Bollinger Bands are narrowing, indicating that a price shift is likely to occur in the near future. The 4-hour chart’s Williams Percent Range has entered overbought territory, which could mean the price shift will be downward. Going short with tight stops may pay off today. The daily chart’s Relative Strength Index has entered the overbought zone, which is typically a sign that the pair will face a downward correction. This theory is supported by the Stochastic Slow on the same chart, which has formed a bearish cross. Going short may be a wise choice today. Most technical indicators place this pair in neutral territory at the moment, meaning that a significant change in price is unlikely to occur in the near future. That being said, it appears that a bullish cross may be forming on the 4-hour chart’s Stochastic Slow. Still, traders will likely want to take a wait and see approach today. Most technical indicators are showing that the precious metal may have reached its peak and could see a downward move in the near future. The Williams Percent Range on the 8-hour chart is currently at -5, well into the overbought zone. In addition, the daily chart’s MACD has formed a bearish cross. Forex traders may want to take advantage of the impending downward move and open up sell positions for potentially high profits. Due to the fact that the pair stopped on the target point it is expected to retrace downward when one of the clear areas of support level is 116.00 which constitutes a retrace of 38.2 to the last upward movement (the movement is highlighted in a discontinuous pink line), in addition the point is an upper area of resistance level that broke out and so constitutes a good support level. Long in the area 115.50-116.00 with the stop approval of the price in the hourly time frame (w pattern or change in the bullish structure). Stop: under the next Fibonacci level – 115.00 50% – 115.50 61.8% in accordance with the entrance point. The pair increased without stopping from 0.9706, area 1.0340 constitutes the level of 127.2% Fibonacci of the downward movement so that preliminary one can see retracement in the first stage at least to the support level that broke out (red) 1.0200 and after from there, there is a potential for retracement of 38.2 Fibonacci 1.0100.
.) is not liable for losses or damages as a result of reliance on the information provided by e-mail or on the overall data, quotes, charts, signals buy / sell. It is hereby clarified that the investor must be aware of risks involved in trading in financial markets, which is a form of investment that may contain potential risks. After hitting a snag for several months now, it appears that the Philippine Stock Exchange Composite Index (PCOMP) or the PSEi has found its winning shape again. Presently, things looks more upbeat now, at least from the technical point of view, for the Philippine economy as it is represented by the local equities index. You see, the index had been trading within a descending channel since November of last year as I’ve pointed out in my recent post just the other day (please see it here). At that time, the index was facing technical resistances at the descending channel’s resistance line and at the 4,000.00 price level. So for the index to resume its upward move which was non-existent for like 5 months already, it needed to free itself from the the channel and move past 4,000.00. In one sweet move earlier today, it did just that when it broke out from the descending channel and pushed itself to close at 4,023.74. Given today’s long green bullish candle indicates some optimism in the market. With the MACD just turning positive and moving above the zero-line, things could indeed look pretty for the PSEi. So if the buying interest in the market could be sustained, the index could aim for 4,200.00. Once it clears that level, 4,400.00 could be its next target. Note: The broad-based buying in the heavyweights Philippine Long Distance Company (PLDT) or TEL, JG Summit Holdings (JGS), and Globe Telecom, Inc. helped pushed the entire market higher.